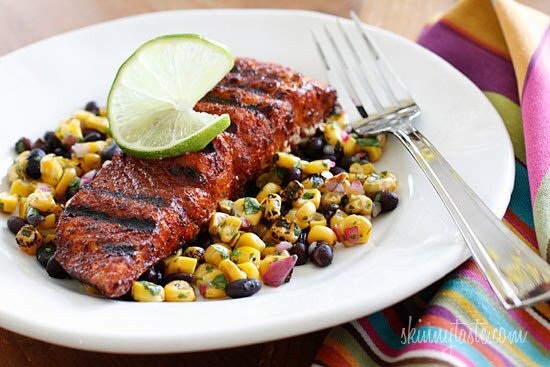 Grilled salmon steaks rubbed with a spicy blend of smoked paprika, chipotle chili powder, brown sugar, cumin and cocoa powder served with a quick side dish of black beans, grilled corn, cilantro and splash of lime juice. You will love the spicy smoked flavors of the salmon paired with the sweet corn side with fresh lime and cilantro flavors. This is a complete meal ready in less than 30 minutes. Salmon is an excellent source of high-quality protein, containing all the essential amino acids and a good source of Vitamin E, a powerful antioxidant. When buying salmon, I look for fresh or frozen sustainable wild options such as Alaskan salmon which is raised in pristine waters – it costs a little more but it’s leaner than farm raised because the fish are raised in the wild and get more exercise, the meat has a natural red color whereas farmed salmon is artificially colored. Coho, Chum and pink salmon have less fat than King and Sockeye varieties. To make this quick side dish, I bought frozen grilled corn from Trader Joe’s. I know many of you don’t have a Trader Joe’s near you so fresh grilled corn cut off the cob or regular frozen kernels would work fine too. Meanwhile, in a large saute pan, heat oil over medium heat. Add onions and sauté 2 minutes; add beans, corn and salt and cook until heated through, about 6 – 8 minutes. Remove from heat and toss in cilantro and lime juice. Heat a clean outdoor grill (make sure the grates are clean and lightly oiled) or if cooking indoors a lightly oiled grill pan over high heat. This is possibly the best thing I’ve ever cooked! I used regular chili powder and paprika and pan-seared. Fantastic!! Thanks Gina! Such a great rub recipe! Great balance of smoky, spicy, and sweet. The only thing I added was a 1/2 teaspoon of garlic powder. My family and I will definitely use this recipe again! This recipe looks delicious! One question, do you use skinless salmon? Delicious! I made the salmon with a side of wild rice and kale/apple salad for dinner. Absolutely yummy. I love the nice crust you get on the salmon from the suguar. I used regular chili powder instead of chipotle because that’s what I had in the house, and it worked just fine. Great, easy, fast recipe! I followed this recipe exactly! Delicious! Thank you! Making this for my mom tomorrow night. I know it will make our mothers day memorable 🙂 what heat do you grill the ‘steaks’ on? Great rub, we really enjoyed it. Grilled the fish on cedar planks but really enjoyed the flavor! This has become one of our family favorites! So good…thanks! Made this for dinner a couple nights ago, and my 3yo daughter and I LOVED IT (hubby doesn't eat fish, so he got chicken). I was skeptical because I never liked salmon, but this was delicious. I let my daughter try it to see if she liked it, and the next thing I know, she's standing at the counter eating all of the fish off her plate! I'll definitely make it again. Made this for dinner tonight. It was delicious! We were out of cocoa powder and I had to substitute lemon basil for lemon, but everything else came together perfectly! I just made the rub for the salmon, but it was very tasty and easy to make! 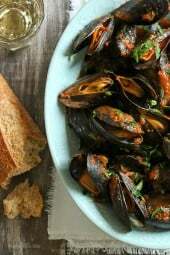 This is the first recipe that I have made from you website and I must say I will be coming back for more and more dinner ideas! I am in the process of lossing some extra pounds that have packed on in the last two years and your website is the perfect place to get fresh meals. I have always loved to cook, but have recently enjoyed making meals from fresh ingredients. This was so easy to make, with a fresh taste!! Absolutely amazing! I made this for my bible study group and boy oh boy they devoured it all and they all said "this is so delicious!!!!!" They raved and went for seconds! This is an excellent recipe and I would tell anyone to make it! GREAT!!!!!!!!!!!! 2) How long would the corn and beans keep? Since I'd be cooking for myself, I wouldn't want to make all the salmon at once because it's not the best for reheating. My husband says this is the best salmon he has ever had. I made this for dinner tonight, and it was delicious. 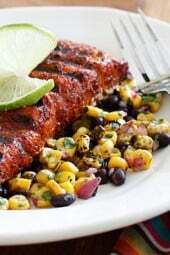 I love salmon, but I enjoyed the corn/ black bean dish as much as the salmon. I grilled the salmon indoors on my panini press/grill, and it was an EXTREMELY easy meal to cook. I will definitely make this again. Okay thisnis ridiculously good, and the second time TODAY I have posted on this site… this is so good and the flavors are amazing together. I justbde ided that I was having salmon for supper and I had all the ingredients called for in this recipe. And on top of that its only 388 calories… what more could a gal ask for. Im having mine with coconut rice as well. Hope this helps.. Enjoy! Can you tell me the WW points for just the salmon? I made this for dinner tonight, all I can say is "awesome". I sliced some avocado over the top. Very Very good!!! A new favorite recipe for salmon. Seriously the best salmon I have ever had! The rub is so amazing. Didn't grill….a bit too cold for that right now….so pan seared with no added fat! Just nonstick cooking spray! My family loved it! Thanks so much! This looks delicious! I love grilling salmon. It takes on any flavors you add to it so easily, and this looks like a terrific combo! Wow… just wow. Everything about this recipe was perfect. Thanks! I more than doubled the spices after reading the comments and this was really good! Hi Gina, I'm planning to make this tonight, and was trying to enter it into sparkpeople. But I keep coming up with something in the 7-800 calorie range? I even tried a different nutrition site, and still got the same thing. Can you tell me how you got 24 oz of salmon split between 4 servings to come up to 399 calories per serving? Thanks!! Just made this tonight – SO YUMMY! Thank you! 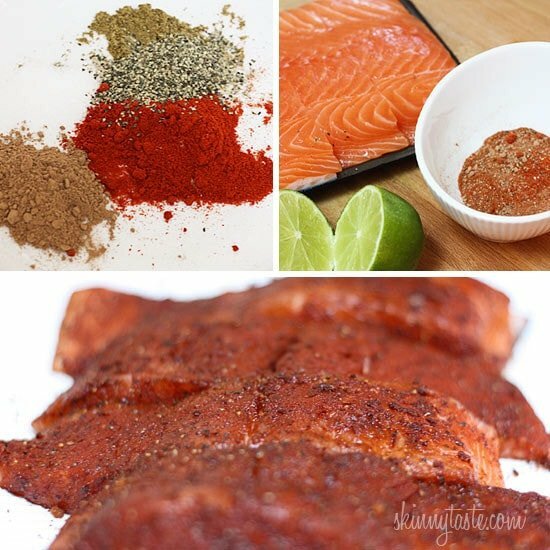 I have made this twice now, its simply the best thing I have ever had on SALMON, ever….sockeye salmon and this rub, the perfect combination….LOVE! These look lovely. One of the other reviewers asked how much it would be for just the salmon. I placed it in the WW recipe builder and it said it would be 6 points plus. I plan to make this tonight with the WW corn fritters and steamed zucchini. Thanks for sharing. I made this the other night. WOW, it was fabulous!! i just made this tonight, and had a quick question It didn't seem like I had enough seasoning, were the measurements suppose to be tsp or tbsp. I doubled the seasonings and still felt I could have used a little more. This was incredible! The most flavorful salmon I have ever had. Everything else has been a little disappointing. I'm making it again tonight! We made this for dinner last night and loved it!! I'm looking forward to some leftovers for lunch!! Really, really excellent! I'm on a major salmon kick lately, good for both my 11 month old baby's and my brain. I put it on the gas grill after wiping the grates with a little olive oil on a paper towel. Got gorgeous grill marks. The black beans and corn are so simple but really flavorful. Made this last night and it was delicious! I made it a little spicier because we like our food hotter than most. My husband is not a salmon lover, but he said I needed to make it again. Also, I sliced an avocado and tomato as a side dish with lime juice sprinkled on it as a dressing. There were no leftovers. We bought fresh caught salmon filets that had skin on and just left it on for cooking. This is our new favorite meal! P.S. My hubby just blurted out "that meal last night was awesome!" I rest my case. Do you cook the salmon with the skin on or off? Made the salmon tonight. Wonderful. Did it in a cast iron pan on the BBQ. Will certainly do it again. I just made this for dinner, and it was absolutely delicious! Thank you! I'm new to cooking fish. Should I remove the bottom skin before I cook in on an indoor grill? This was so delicious!! Thank you! Thank you for this recipe. I've made it twice already. It's my husband's new favorite dinner. We made this tonight (under the broiler, as I didn't want to pull out the grill) and it was divine! Thanks, Gina! I tried this recipe last week and it was amazing. I live in a tiny NYC apartment and grilled the fish on my George Forman grill. The entire dish looked great once I plated it, and tasted just as good. I'll definitely make this again. Living in the Northwest, I'm always looking for new salmon recipes. This was fabulous! It will definitely be one of our go to recipes. Thank you! This is a very unique way to make salmon and it looks delicious. For my area wild salmon is in season and this is a great new way to eat it. 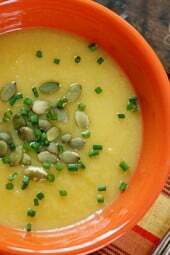 I would love for you to link up this recipe on my Seasonal Eats May roundup <a href="http://delectablemusings.com/2012/05/seasonal-eats-sheet-may-2012.html>found here</a>, which highlights recipes that use seasonal ingredients in great recipes. Just made this tonight — we loved it! A new favorite. Simple and tasty, all flavors actually go together very well. Something a little different for salmon. Yum! I will definitely make this again. There are no words to describe how freakin' amazing this is. Truly. And, I'm not a huge fan of salmon. I was cussing the price of the smoked paprika and whining at having to touch the fish. Never again. This is a winner. So, I guess I did find the words. I made this last night and it was fantastic! My husband and 8 year old daughter both loved it. Great smoky taste from the rub & salmon is wonderful grilled. I will make this again. This is beautiful – such fresh and vibrant colours! Exactly my kind of dish! I just made this for my family, it was a huge hit, and SO easy! Even my 2 y/o daughter liked the salmon! The corn and black bean side was so good, I could eat that all day long. Great 10 pp meal, thank you! Another great one Gina! The BF (who is not a big fan of salmon) even went back for 2nds! We will have this again and again, not to mention a good one for summer grilling! Thanks Gina, you are amazing! Such an awesome salmon recipe, even my brother who is not a fan of fish loved it and went back for seconds!!!! The salmon was AMAZING!!! Thanks Gina!! Do you have the calories for just the rubbed salmon–no veggies? Thanks! Oh man, this is a delicious way to prepare salmon! What a great, easy recipe for this summer. Got to try it! Sometimes I feel intimidated by recipes with salmon but this one looks pretty simple. Does the salmon hold together well on the grill? If it helps, I prepared my salmon fillets in aluminium foil (with olive oil to prevent any sticking or burning) and I cooked them for 8 minutes on the barbecue at 450F, the foil opened on the top. In the event I could not use the barbecue, I would do them in the oven (skin removed) on parchment paper covering a cooking sheet, 10 minutes at 450F. This is THE best salmon dish I have ever prepared, honestly. Absolutely amazing, restaurant worthy! This recipe will become a classic in our house. Thank you so very much! Gina, OMG. This was so amazing. I could have eaten three servings. looks delicious, my husband doesn't care for salmon, any suggestions of what kind of fish I could substitute it for ? Thanks! The same seasoning would be great on any fish, just adjust the time depending on the thickness of the fish. We love salmon in this house! Always looking for new ways to cook it up. I switched over to wild salmon over the years, what a difference! I love all your recipes!!! I made this for dinner, last night with company that included 3 little girls under 6. There was not a single, tiny piece of salmon, left over!! The 3 year old, kept asking if there was more. My husband loves my cooking, and this morning he told me that the dinner was so good is was 'memorable'.I paired this with you mango, cabbage slaw and asparagus wrapped with prociutto. Thank you so much for all your work and great recipes! I'm glad your whole family enjoyed it! I can't get my 2 year old to like fish yet. I hope she does when she's 3! I know I should eat salmon but fish just isn't my favorite – do you think this would work well with chicken cutlets? I think these flavors would be great for fish. 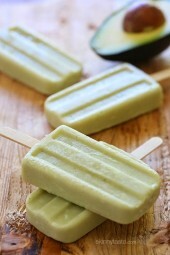 nice recipe… i have try this on today and it's very tasty..
Ummmm…give me some of dat! 🙂 Goooorgy. This looks fantastic! I am always looking for different ways to cook fish since I've had to add lots more into my diet! My husband is not a salmon fan (I have to get wild caught or he won't eat it!! ), so the more flavorful I can make it the better. If you use frozen corn should it be thawed first? I would personally thaw them first, otherwise they'll require more time on the stove. I usually just pop the frozen corn in a sieve/strainer and run hot tap water over it- takes no time at all! Yes, no need to thaw, it heats up quick! We eat salmon once a week but I make it the same way every time, so excited to have a fresh, new recipe to try! This looks amazing! I don't have an indoor grill and would like to know what type of grill you to buy. Im on a very strict diet, no sugar allowed. Can the brown sugar be omitted, or substitued for something else? This looks heavenly, and I love salmon. Thanks in advance for your help. Sure, you can leave it out. This looks amazing. Is smoked paprika easy to find? Can't wait to give it a try. Yes it is. If you can't find it, use Hungarian or any paprika would work. OMG those spices sound amazing together! I can't wait to try out this recipe, we love salmon. As I am just now trying to photograph food I want to commend you on the fantastic photography. That photo looks amaaaazing I am making immediately! Cocoa powder – now that is one I've never heard! Thanks for this recipe, and thanks for explaining the different types of salmon – very interesting! I am wondering if grilling this on cedar planks on the grill would work well…what do you think? Yum! I have never made salmon ate home before, and I love it! I think this recipe would be perfect for me to try out! Thank you for keeping us healthy! Salmon is so easy to make! Oh wow, yum. I'm a recent salmon convert (I know, shocking) so this is perfect! And chipotle powder ameliorates everything, so I don't see how you could go wrong with this one. Thanks!! I wouldn't go near it when I was pregnant for some strange reason, so I understand! I just made this – delicious way to eat salmon, thanks! I've been looking for things to make on the grill since I'm a vegetarian who just purchased a grill. Yum! Thanks for the great recipe! Best dinner I've seen in awhile. Bravo! Try asain groceries, they sometimes have them.. otheriwse im with you, impossible to find canned black beans! Have you tried USA Foods Store in Melbourne? They have a website where you order foods to be delivered. I just got a box of stuff for Christmas. If I don't have a grill or a grill pan, would you suggest broiling or using a skillet? I personally like the char so I say skillet. I want to eat this right now. It looks so good and so easy to make! Delicioso! Looks delicious! 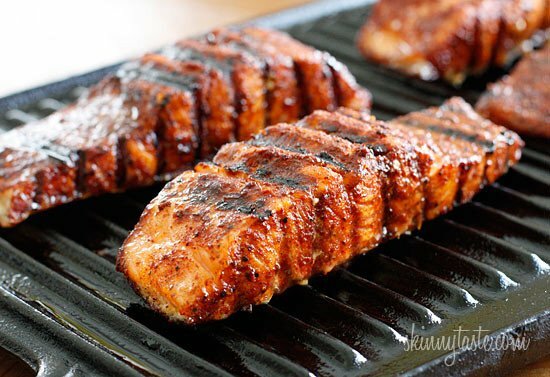 I love grilled salmon and can't wait to try the spicy rub. The black bean salad looks great too. That looks so good, since I'm allergic to salmon I will try with farm raised Tilapia. Any idea what the calorie count would be without the veg? I'm not a huge fan of corn, so I'd probably develop my own side dishes. But this looks excellent! a) myfitnesspal.com (or the app) lets you plug in ingredients and develop "recipes" to check calorie info for yourself.